Thanks to the newly-revealed "Theater of War" mode, Company of Heroes 2 boasts a number of interactive tales from the last "great war." World War II was an undeniably big deal. As the name suggests, there are few areas of the globe that weren't somehow affected by the combat, and as a result there are hundreds of amazing stories stemming from the conflict. This is problematic for anyone developing a game set during World War II, as it makes it very difficult to select just one story to focus on. Most devs opt for big, historically notable set pieces like the D-Day landing, but after more than a decade of omnipresent World War II titles, all the biggest battles have been covered ad nauseam. With Company of Heroes 2 developer Relic Entertainment has a plan to sidestep the entire issue. While the game will feature the standard campaign mode, with its single, relatively simple story, Relic has also just announced a new "Theater of War" mode that drops players (or groups, owing to its co-op functionality) into a host of different situations drawn from throughout the war's hotly contested Eastern Front. Further, the Theater of War mode allows Relic to easily insert new content into the game via DLC without having to shoehorn it into the extant singleplayer campaign. 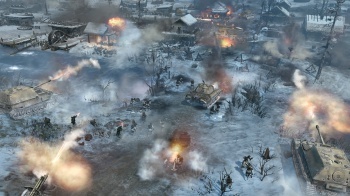 Theater of War allows Relic Entertainment to tell different stories from the conflict in the form of new playable single player and co-operative content. The mode includes solo challenges where players are pitted against overwhelming odds, AI battles against an enemy commander with a unique play style and co-operative scenarios for fans to enjoy with their friends. At the launch of COH2, the Theater of War mode will include missions from key battles in 1941. Choosing either the Soviet Red Army or the Germans, players will visit different locations across the Eastern Front and take part in some of the most famous battles that occurred that year. Each faction has 9 unique missions included. More Theater of War missions will be added to the game at a later date, including the previously announced mini-pack for all eligible pre-order customers. So to recap, it's a new single-player and co-operative gameplay mode that offers variations on the game's core campaign, with plot elements drawn directly from historial accounts of actual battles fought by Soviet and German forces. That seems a great fit for Company of Heroes 2, and is a clever way to extend the game's lifespan -Â a win for both players and the people making the game. The only downside we can see is the lack of competitive multiplayer content within the mode. It makes sense to have two players take command of the opposing armies, right? Well, yes, but then the game would be unable to tell a historically accurate story, instead constrained by whatever decisions the players make. So, while we mourn for this perceived lack of functionality, it's understandable given the nature of the Theater of War mode. Company of Heroes 2 is slated to make its PC debut on June 25.